The ZEPHYR® brush is, without question, the finest brush ever developed for use in applying latent print powder to dust for latent fingerprints. The 6 1/2" long brush consists of thousands of fiber bundles, each being composed of over a hundred individual treated-glass filaments. 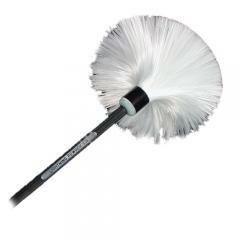 The diameter of the glass filaments is a fraction of the diameter of regular hair fibers used in other fingerprint brushes, resulting in a brush with unsurpassed working qualities. The outstanding characteristics of the ZEPHYR® brush are its long life, capacity to pick up and retain large amounts of fingerprint powder, and the fact that the filament ends become softer with use. Use one ZEPHYR® brush for black powder and one for silver/gray powder. Since 1956, the ZEPHYR® brush is the ORIGINAL and still the best fiberglass fingerprint dusting brush available..Do not be misled by imitators who may claim superiority for their product. In my opinion, Zephyr brushes are the only brush for print lifting. Do not buy Camel Hair brushes.